One of the most common issues among language learners, and definitely a huge problem for me, is nervousness about actually starting to use your new-found language skills and talk to people in the language. I always worry that I’ll make mistakes, that someone will laugh at me, that the other person will judge my language knowledge and find it wanting, or that I’ll simply run out of things to say and the conversation will shrivel up like a raisin. But never fear… here are my tips to beating the nerves and getting chatting! If you’re a bit shy or underconfident, I wouldn’t recommend launching into a discussion of Proust with a native Frenchman in a Parisian bar. Instead, try setting yourself very small goals to boost your confidence. Order a coffee, ask for directions to the nearest ATM or ask the time in the language, for example. Start from there and build up gradually. It can be hard to open a conversation with a total stranger, so you can always start by practising with a teacher, a friend who speaks the language or via Skype to a relative or friend in the country. It’s less intimidating to practice French with someone if you can then switch around and help them with English in return, as it makes you feel like you’re in the same boat. Or with a tutor or online teacher (iTalki, for example) you know that they’re there to help you and won’t laugh at your mistakes. This is a big problem for me. What if (God forbid) I mis-conjugate an irregular verb in the pluperfect! What if I put the wrong ending on a German adjective? What if I accidentally describe myself as pregnant when I meant embarrassed? Well, so what!? Every single person who has ever learned a language has made some mistakes. Think about some of your friends who are non-native speakers of your language. They’ve probably made an error at some point, and you (hopefully) didn’t laugh at them, so why would they do so to you? A few mistakes don’t impede understanding, and it’s very unlikely that the person you’re speaking to will criticise you rather than help you and appreciate that you’ve made an effort. This is something that I’ve learned recently from a friend and travel buddy of mine. Whilst I speak pretty fluent German, his is pretty basic and not exactly error-free… However, the big difference is he is absolutely not afraid to go and use what he knows. On a trip to Berlin recently, he easily managed to negotiate a mobile data package, ask for directions, chat with sales assistants and find out various information from locals. The difference is, for him, language is just a tool to get results. If you ask for something and you actually get it, your langugage skills are working. If you can make yourself understood, then you’re doing pretty well! When I got sick during the trip and needed to make a trip to the pharmacy for a specific medication, I was pretty glad that my German skills were sufficient to resolve an otherwise painful situation. Concentrate on getting your message across or getting the information or help that you need, not on whether or not your grammar is perfect. This might come as a surprise to some English speakers, but not everyone speaks English. 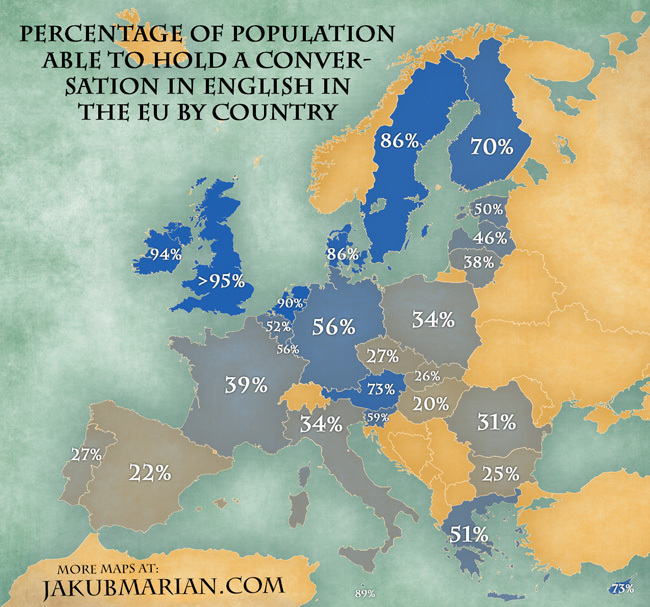 In fact, in Spain the number of people who can hold a conversation in English is as low as 22%. The good news is, if you manage to go to a country or area where not so many people speak English, you’ll have a bit of extra impetus to speak the local language. When I was in Italy last new year, I found that many people didn’t know any English. This forced me to use the little Italian I did know to do things like ask for the bathroom in a café, as I couldn’t rely on English to get around. If the other person doesn’t speak your language, then they will certainly appreciate you speaking theirs, even if it’s a low level. And you’ll get a confidence boost from managing to get by with what you know. This is a favourite strategy of mine. I spent 2 months in Madrid as an aupair when I finished university, and it probably taught me more than my degree! Kids tend to be chatty so you’ll get plenty of conversation practice. They also don’t tend to care about what rubbish you’re speaking, so long as they can understand. It’s hard to feel self conscious when a 4 year old Spanish girl is chatting with you about Bob Esponja or Disney, so make the most of the opportunity for relaxed and silly chat without worrying about how you sound. Children are more patient with mistakes and inane chat, whilst an adult might get tired of talking to you if you can’t keep up with a proper conversation. Find a friend who is also learning and travel/go to a class or meet native speakers with them. You can help each other out, and your confidence will be boosted by sharing the experience with someone who is at the same sort of level as you. This last strategy isn’t for the fainthearted, but once you’ve done some of the steps above, this is the best way to improve. Obviously the best way to do this is to move to the country (sorry). But you can try immersion courses, a long holiday to an area where there are not too many tourists, or finding a group of native speakers to hang out with regularly. The more you put yourself in an environment where you’re surrounded by the language and where you don’t have much option but to get on with it, the more you’ll start to acclimatise and see what you can do. I hope something here helps you to make the most of your language abilities and to enjoy the excitement of using your foreign language in the country! Does anyone else have any other strategies to share? My local library in Pittsburgh, PA holds free beginners and conversation classes in lots of languages, including ESL speaking and reading for anyone in the area who wants to work on their English and is too shy or scared to speak in the ‘real world’. It’s worth looking for free programs held by libraries or community centres nearby, since it’s a great resource for people who want to polish their language skills in a ‘safe’ environment.